Today, when you order "The F.I.S.M. Act by John Cornelius", you'll instantly be emailed a Penguin Magic gift certificate. You can spend it on anything you like at Penguin, just like cash. Just complete your order as normal, and within seconds you'll get an email with your gift certificate. Order in the next 5 hours 59 minutes and it will ship TODAY! John Cornelius is one of the most creative magicians in the world and the first American to win a F.I.S.M. World Championship of Magic cometition (First Place in Close-Up, 1979). In 1985 he decided to enter the card division and once again won first place. For that competition he designed a very special act titled Every Card Trick In The World In Under Ten Minutes. 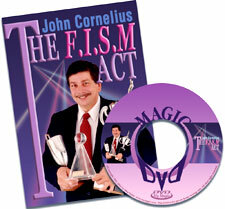 On this DVD John performs and teaches the multiphase act that is full of startling and visual card magic. You will learn the entire act in great detail as he teaches you how to construct the props, set up the act and perform all the effects and techniques. Includes a live performance at The Magic Castle.